Mid-Atlantic beauty-philes have long awaited the arrival of Drybar, with its “No cuts. No color. Just blowouts,” concept. And they haven't exactly been waiting patiently — apparently, hundreds of D.C. women sent tweets and Facebook messages urging the salon to come to the nation's capital. And now, finally, founder Alli Webb, a naturally curly girl and longtime stylist, has heeded those virtual calls and decided to open not one, but two locations in the DMV this fall. Opening October 19, Drybar Georgetown and Drybar Bethesda will offer signature blowouts for a flat price of $40 (regardless of hair thickness or length). Both salons are keeping with the brand's aesthetic, featuring tufted walls, a marble bar with built-in iPhone docking stations, and flat-screen TVs. All you have to do is choose one of the five blowout styles on Drybar’s style menu, which reads like a cocktail list, and plop down in a comfy chair for some streamlined pampering. Suffice it to say, we think Alli and her beauty-biz concept are pretty genius, so we picked her brain about secret hair-care tips, Michelle Obama's 'do, and her celeb hair crushes. 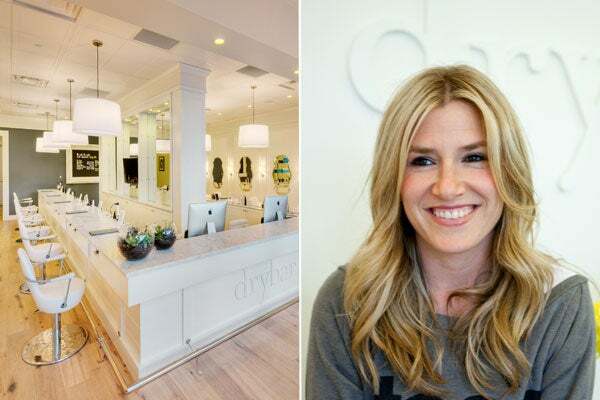 What was the inspiration behind opening the first Drybar? "At first, it was personal necessity. Being a curly-haired girl, I always wished for a fun, pretty place to go for a great blowout at a great price. But nothing existed. There were only two options out there: a discount chain, where the experience was off, or a cut-and-color salon, where you pay upwards of $60 for a blowout. I felt like there was a major void in the market, so I teamed up with my brother, Michael Landau, our CEO, and my husband, Cameron Webb, creative director, to create what [myself] and lots of other women were longing for." Which of the five blowout styles do you think will take off in D.C.? "I'd love to see the sophisticated ladies of D.C. rocking Mai Tais (beachy, messy waves), as well as the Cosmo (lots of loose curls)." Any tips for making a blowout last longer? "There are lots of [product] options, like dry shampoo, and then there are tricks like re-blowing just your bangs/fringe area — it can really brighten and freshen up your whole blowout. Also, on the third or fourth day of my blowout, I will pull the sides back into a twist or braid ... totally hides the dirt/oil build-up and gives me a new, fun look. Adding accessories helps even more! I also strongly recommend the terrycloth-lined Drybar Morning After Shower Cap, which will extend your blowout for several days." What's your best bargain-beauty secret? "Mixing pomade and your favorite oil to help tame frizzy ends while adding shine. I've been known to use hand lotion in a bind to smooth out frizzy ends, too." "Burt's Bees. Love the lip glosses with a hint of color." "Toss up between Gwyneth Paltrow and Mila Kunis. They have great hair that looks great in so many styles — messy, beachy Mai Tai, poker-straight Manhattan (sleek and shiny). They can do no wrong in my book." What are the best hair splurges (products, treatments, etc.)? "Hair shots or masks. We use a few shots from L'Oreal that really help boost dry, tired hair. I highly recommend them." Which Drybar blowout style do you think Michelle Obama would choose for herself? And which would you recommend for her? "Oh, fun question, I love her! I bet she would be a Straight Up (basic blowout with a little body and bend). However, she could totally rock a Cosmo." Where: Drybar Georgetown, 1825 Wisconsin Avenue NW, 202-609-8644; Drybar Bethesda, 4840 Bethesda Avenue, Bethesda, 240-483-4277. Book appointments online, by phone, or through the Drybar iPhone app.